I mean really? A Dunsparce has the same height as a Cresselia, Darkrai, Swampert and Salamence (4'11" / 1.5 m). This is because some Pokemon are measured horizontally instead of vertically. As for why Game Freak has not measured all Pokemon vertically, or fixed the sizes, I'm not sure. Either this is intentional, or Game Freak has not gotten around to it. Sorry if my art is too MLG. 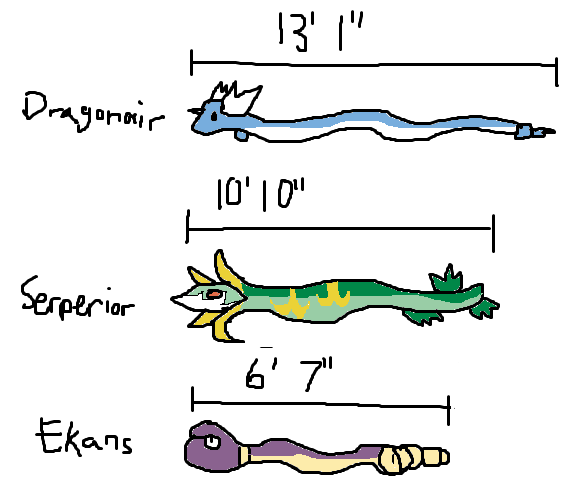 Many Pokemon sizes still don't make sense though. Lucario is only 3'11", and that's also the size of a Seadra and an ELECTRODE. Also Ghastly has a size of 4'03", which is also the height of a NIDOQUEEN. I think GameFreak should really fix this and some creepy Pokedex entries. Electrode is a really big ball, and Lucario is really small. Gastly is all gas, and is four foot three --- similar to a Nidoqueen. Game Freak makes the sizes. I am not entirely sure about them myself. Okay, I just want to clarify the fact that we have never seen Pokemon in real life. Dunsparce is 1.5m, or 4'11'' in length. Length. According to here that's around the size of the average US female human, which even in length, is huge. Dunsparce doesn't even look that big, but apparently it is. Charizard is 5'07'', or 1.7m, which is about the size of the average male (according to the link above), same as how Deoxys and Heatran are also the same height. This may not have been Game Freak logic at all, Game Freak might have added these ridiculous sizes for the sake of easter eggs (for the people who notice, and get a laugh out of it) or they may have actually imagined it to be that height. But you've never seen Pokemon in real life, so you really have nothing to compare it with. Like, you see that tree over there? In the distance, outside your window? It probably looks about the same height as you, but when you go closer to it it looks like the size of a Wailord. So don't jump to conclusions. answered Oct 18, 2014 by !'•-Indigo-•'! Yes, but they should have used logic to make Pokemon sizes. And I compare them with animals. It's what many Pokemon are based on. Height isn't always how high the Pokemon is in a Pokedex entry it can be the length as well. For example dunsparce is obviously not 1.5m high but it is if it is placed with it's tail on the ground and head in the sky it is. Which actually is the Maximum size of the named Pokemon.